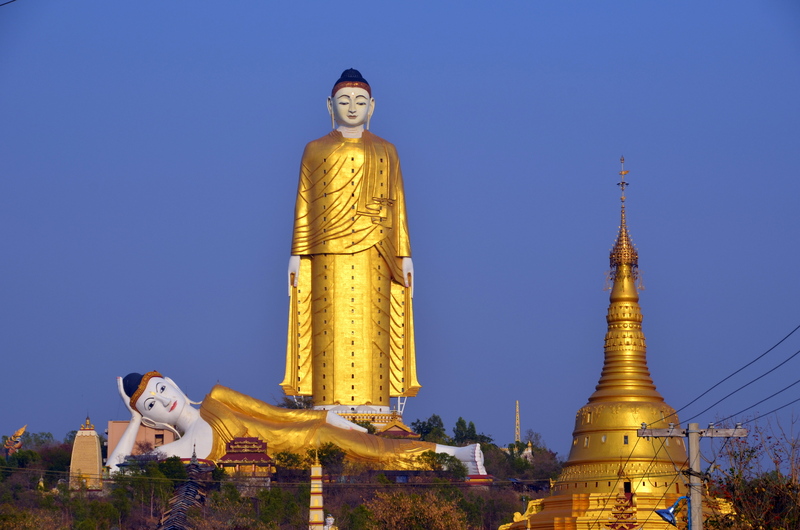 Monywa is just some 136 miles west of Mandalay, and it seems that in this devout Buddhist country, there are important temples, pagodas and stupas every inch of the way. So many, in fact, that it’s possible if you don’t pace yourself to develop stupa stupor, not unlike an overdose of ancient cathedrals during tours of Europe. 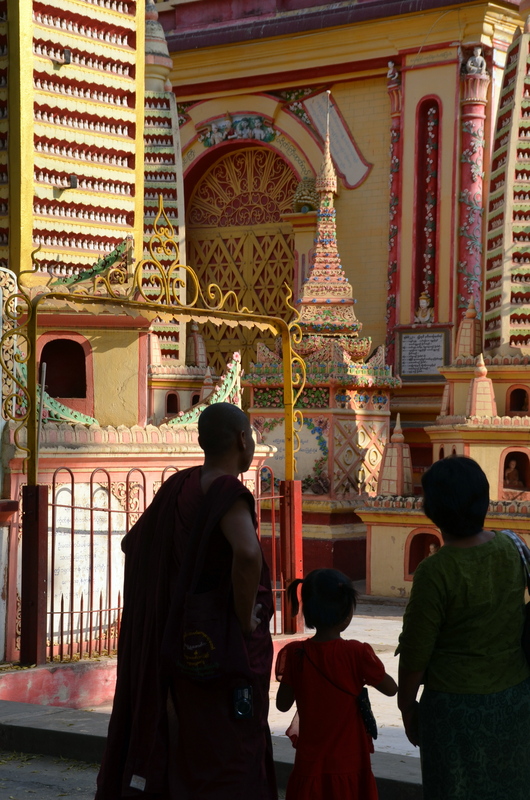 The massive Thanboddhay Pagoda complex, painted in brilliant hues, houses 845 stupas, and 580,000 Buddha images covering every wall and archway. The main pagoda is meant to remind the devout of Mount Meru, a sacred mountain in Buddhist mythology that was considered to be the center of the physical, metaphysical and spiritual universes. Nearby is the giant LayKhunSatKywar Standing Buddha, another of the country’s landmarks, rising as it does to some 30 stories high. On each floor inside, the different levels of hell are portrayed. A Buddha as tall as a 30-story highrise in the U.S. But it is the Bawdi Tahtaung, one of the country’s most well known sites, that surprises. 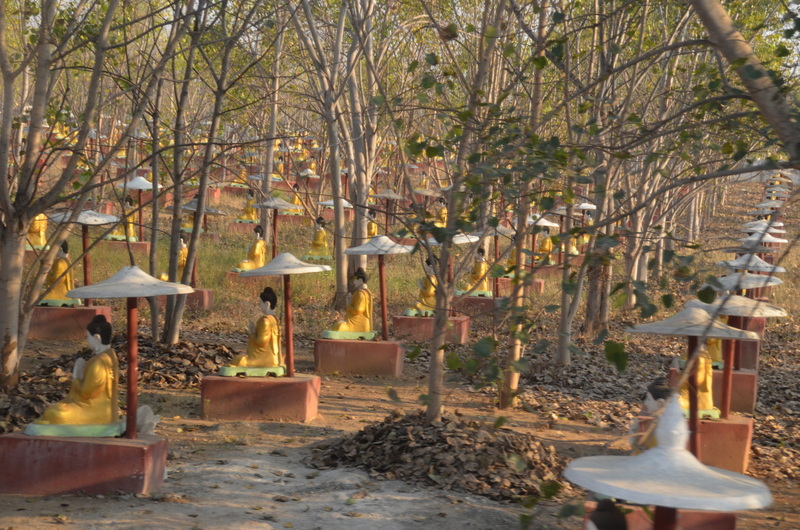 Suddenly, in long straight rows, as far as they eye can see, and weaving between a forest of trees, are a thousand life-size sitting Buddhas. For me, it was reminiscent of the army of giant terracotta warriors in China, intended to protect a second century BC emperor in his afterlife. Originally, in Bawdi Tahtaung, each Buddha was meant to sit at the foot of a multi-trunked banyan, the canopies of each can can grow to a thousand feet in diameter. The banyan tree is considered sacred as Buddha achieved enlightenment in India while meditating under one. Today, in Bawdi Tahtaung, there are double the number of banyans, but the groves of trees and Buddhas are astonishing as they disappear into distance. 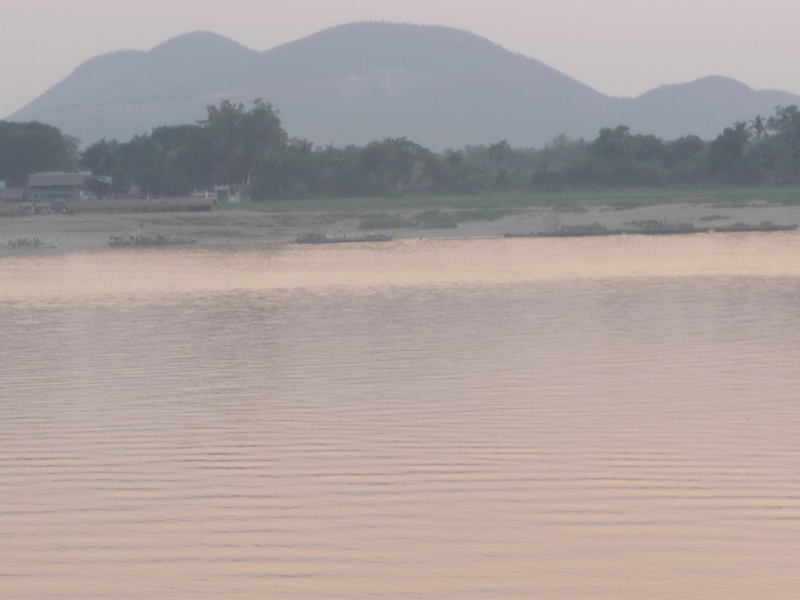 With all this regional religiosity, one expects tranquility, and this is what the small town of Monywa on the banks of the Chindwin River initially projects. It is a shock to learn that it was just across the river from here that one of the more brutal atrocities carried out by the government against civilians took place as recently as November last year. Locals and monks had been peacefully demonstrating outside the Letpaduang copper mine, a joint project by a Burmese military-owned holding company, and a Chinese weapons manufacturer. Farmers were unhappy that their land had been illegally confiscated for the mine, and people were also concerned about health problems being caused by the mine’s pollution. In the middle of the highest hill can just be seen the copper mine where peaceful demonstrators were attacked with white phosphorous four months ago. On November 29, 2012, police and commandos fired incendiary grenades containing white phosphorous at the peaceful demonstrators. White phosphorous burns at 5,000 Fahrenheit (water boils at 212 F.), generating two to three times the heat of napalm. Known as WP, it can burn to the bone, kill when inhaled, and be absorbed through the skin resulting in multiple organ failure. Grotesquely, unlike napalm, it can also burst into flames again when the victim is on the operating table, or even several days later. Not surprisingly, its use against civilians was banned by international law in 1980. A number of the severely wounded monks who survived were flown to Bangkok, Thailand, for treatment after the attack, and are still hospitalized there four months later. Authorities initially claimed that they used water cannon, tear gas and smoke grenades to disperse the demonstrators. But an independent study forwarded to the government-appointed panel headed by opposition leader Aung San Suu Kyi to investigate the incident showed that white phosphorous was used. A case once again of the head of the snake not knowing what the tail was doing? This entry was posted in Uncategorized on March 12, 2013 by jangoodwin.